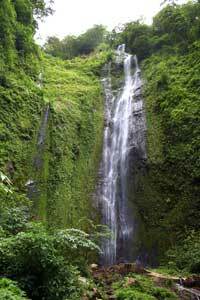 San Ramón waterfall is located on the island of Ometepe at the southern slope of the Maderas Volcano, about 3 kilometers far from the small village of San Ramón. Nature is in abundance along this trail, and there are many animals that can be ear or seen. Howler monkeys live in this area and they cab be seen easily. By being alert and lucky, different types of snakes can also be seen, including boas. Other animals that can be seen include a wide variety of bird species and insects. Crystal-clear water flows from the waterfall year-round, and halfway up the trail there is a hydro-electric plant that uses the water pressure to create electricity. Near the electric plant the the path splits into two directions: the path to the right leads to the waterfall, the path to the left to the top of the volcano. The temperature and humidity can be quite high especially in the summer, so it's recommended to bring enough water or other drinks. Sunscreen can also be useful, and of course bathing suits for the ones who plan to cool off below the waterfall. The village of San Ramón can be reached by car or bus. The bus to San Ramón leaves Moyogalpa at 8 a.m., returning daily at 2:30 p.m.